Vin Santo, literally 'holy wine' or 'sacred wine', is often referred to in Chianti as il vino dell'amicizia, the wine of friendship. 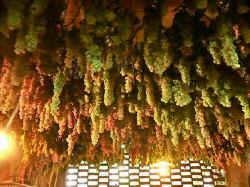 It is a Tuscan wine made from grapes, usually malvasia, trebbiano and columbano, that have been hung and desiccated slightly in the warm air that blows through the tiled windows of the drying room. 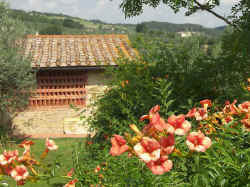 You will notice these two-storey structures with slanted tiles in the "windows" all over Chianti. In recent years, many have been converted into accommodation. Sometimes the grapes are laid out on mats in a warm part of the house. The result is a wine with higher than usual alcohol level which can range from dry to sweet but which invariably has a strong, perfumed flavour. The yeast used in the fermentation is a special strain that can live at the higher alcohol levels. Since the Middle Ages, Vin Santo has played an important part in the history of Tuscan wine. There are many fantastical theories about the origin of its name. A legend from Siena has a friar in 1348 curing the sick with the wine normally used by the Brothers to celebrate Mass. The conviction that this was a miraculous wine spread, leading to the name "vin santo". Another story relates that during the Ecumenical Council held in Florence in 1349, the Greek patriarch Bessarion exclaimed, upon drinking the "vin pretto": "This is the wine of Xanthos! (pronounced "zanto")", probably alluding to the famous Greek "Passito" from Thrace. Another variant has him exclaiming "xantho", meaning "yellow". His fellow diners believed that he had discovered qualities in the wine worthy to be proclaimed "santo". In any event, from that time on "vin pretto" became "vin santo". A less picturesque explanation is simply the association of this wine with its customary use during Mass. Vin santo has always been the wine of hospitality and friendship, and it is still to be found in most Tuscan homes. It is a wine to enjoy at any time of day, although after meals is preferred, and almost always accompanied by cantuccini (biscotti di Prato), a kind of almond biscuit traditionally made in Prato but in fact of Sicilian origin, Sicily being the home of the Italian almond. 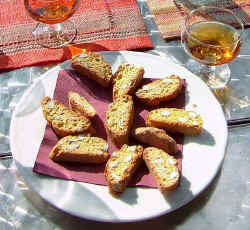 Cantuccini are very hard so the normal procedure is to soften them by dipping them briefly into the vin santo. Even today, vin santo is still the wine of tradition because it is still made using the antique methods: from selecting the best bunches of grapes, to drying them on mats or racks, followed by long ageing in small casks. Note that a traditional vin santo usually has no year designated. This is because most makers of this wine have 6-7 small casks in their cellar. When the currently tapped cask is half empty, it is topped up with the new vin santo and moved back to the end of the queue. Genuine vin santo is thus a blend from several years of production. However, commercial and DOC vin santo is vintage dated. The recognition of the DOC Vin Santo del Chianti in August 1997 marked an important stage in the quality evaluation of this highly traditional Tuscan wine product, which includes both the "Occhio di Pernice" (which is slightly reddish in colour because it contains around 50% sangiovese grapes) and the Riserva categories. Vin santo is ready to drink almost immediately and can be cellared in the bottle almost indefinitely. It is worth noting that the first DOC designation from the Gallo Nero Chianti Classico area was assigned to vin santo, a product emblematic of Tuscan winemaking. Chianti and the Chiantigiani © ammonet InfoTech 2006 - 2016 All rights reserved.